While the Fourth of July is commonly associated with sparklers and fireworks, many pet owners are familiar with the fear that pets feel with each sizzle, boom, and pop! 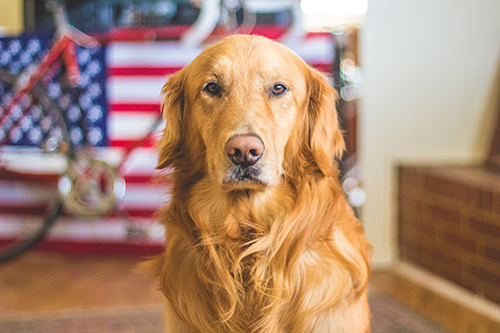 Dr. Lori Corriveau, wellness clinician in the Veterinary Teaching Hospital’s Small Animal Community Practice, reports there are many simple ways to protect companion animals during celebrations over the holiday weekend. "Owners must use common sense when they allow pets to join the festivities," said Dr. Corriveau. "Some dogs like chasing those spinning and swirling objects on the ground. Others fear loud noises. Owners can use simple tricks like putting cotton in their pets' ears to muffle the sound." Never leave pets alone outdoors, even if tethered or in a fenced yard. Dogs, especially, may escape and become lost or injure themselves chewing or choking on their leashes. Keep small pets indoors, preferably in a room without windows, and horses in their stalls. Make sure all sharp objects are removed from enclosures. Put indoor pets into a small, darkened room they are familiar with. Turn on the radio or TV for distraction, and reward calm behavior with high-value treats. Exercise your pets thoroughly before the fireworks start. A tired pet is a less anxious pet and will generally be mellower during the festivities. Do not take pets to fireworks shows. Do not leave a pet in a car unattended. Keep pets on leash or in a carrier if they must be outside. Protect animals from children who may not realize that waving sparklers or setting off "safe" fireworks could upset pets. Make sure your pets have updated contact information on their collar or harness. Consider leaving their IDs and harness on during this stressful time. Sedate horses and some dogs if needed. Noise phobia can get worse as a pet ages. A veterinarian can advise about giving a mild sedative or tranquilizer to calm the fears of an over-stressed dog, cat or horse. Consider behavioral therapy to desensitize your pet and reduce the risk of panic. Desensitize your pet by playing CDs that contain noises of thunderstorms, fireworks or gunshots. Check your yard and your home for food scraps, leftover sparklers, or other debris that could be harmful for your pet. Take a current photo of your pet in case the worst happens and your pet gets loose. You will want a current picture to share to help you reunite.